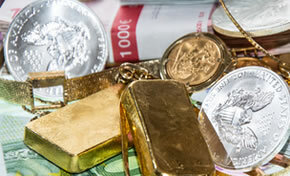 Most precious metals ended lower in their start to the new trading week Monday. Palladium was the exception, rising 1.6%. Gold for April delivery declined $8.20, or 0.6%, to settle at $1,291.10 an ounce on the Comex division of the New York Mercantile Exchange. "For the most part, investors are still most interested in the equity markets and are not finding a need for any safe-haven products at this time," Reuters quoted Walter Pehowich, executive vice president of investment services at Dillon Gage Metals. Gold futures ranged from a low of $1,290.60 to a high of $1,299.20. They rose less than 10 cents last week. Silver for May delivery fell 7.5 cents, or 0.5%, to close at $15.274 an ounce. Silver futures traded between $15.22 and $15.37. They climbed last week by 0.6%. April platinum dipped 80 cents, or 0.1%, to $816.80 an ounce, ranging from $813.10 to $818.80. Palladium for June delivery tacked on $23 to $1,482 an ounce, trading between $1,463.20 and $1,480. Both metals registered losses last week with platinum plunging 5.3% and palladium falling 3.1%. Gold declined $4, or 0.3%, to $1,292.75 an ounce. Silver added 18 cents, or 1.2%, to $15.295 an ounce. LBMA prices last week fell with losses of 1.2% for gold, 2.9% for silver, 5.2% for platinum, and 2.8% for palladium. U.S. Mint bullion products registered increases of 10,500 ounces in gold coins; 974,000 ounces in silver coins; and 1,500 ounces in platinum coins. 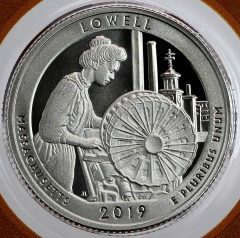 A portion of the silver sales included the first 2019-dated America the Beautiful Five Ounce Silver Bullion Coin. 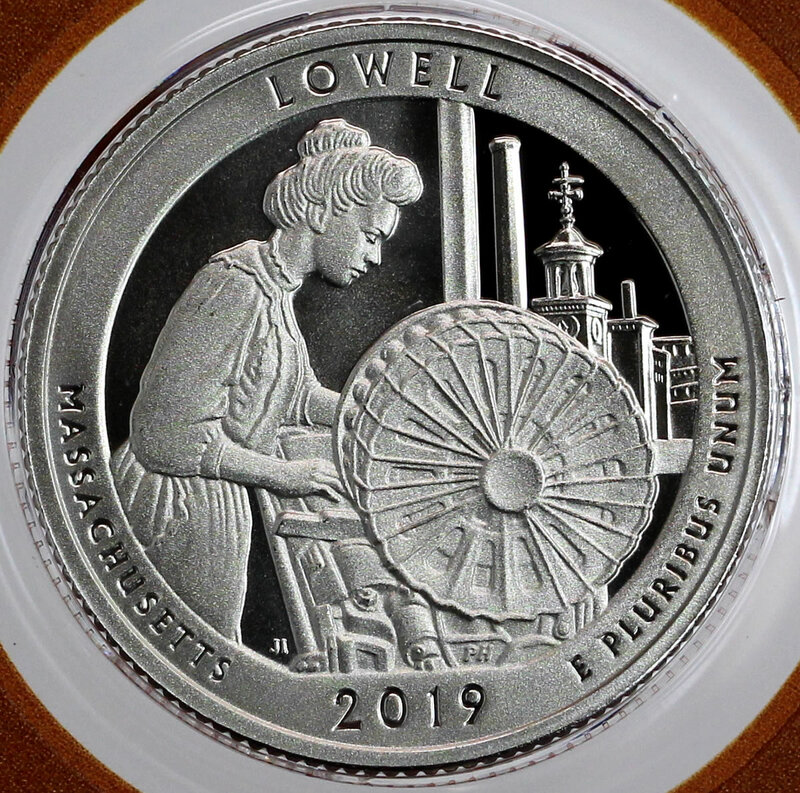 Emblematic of Lowell National Historical Park in Massachusetts — just like the companion quarter, its first-day sales reached 39,000 coins for 195,000 ounces.